Indio is a city that is located in Riverside County, California, United States. As a part of the Coachella Valley it is a distance (as the crow flies) of 23 miles due East of the world famous Palm Springs Resort, 77 miles East of Riverside, CA and 124 miles in the East of Los Angeles, California. Today, the nickname of this beautiful city is the ‘City of Festivals’. It was rightly given this name due to the abundance of festivals that occur in the area all year round, of which the most notable is the Coachella Valley Festival of Music and Arts. The surrounding geography and natural environment plays an important role in determining the prevalent climate in the Coachella area. However, the year-round warm weather is due to the high mountain ranges on its three sides. The average annual high temperature of Indio is 31.9 °C and its average annual low is 16.7 °C. Per year, there are around 350 days of sunshine. 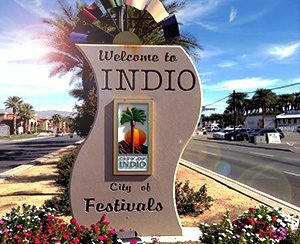 Homebuyers in the Coachella Valley searching for the perfect, family home, retirement community, or second home should consider Indio as a part of their real estate search. In Indio you will find both affordability and quality in homes ranging in style from from ultra-modern masterpieces to classic traditional single-family homes.